The baptism of a child or adult marks the beginning of a life of faith. 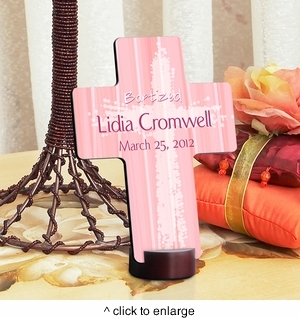 Commemorate that special day with a gift of the ultimate Christian symbol – the cross. Our Personalized Baptismal Crosses include a sturdy base for displaying. It is perfect for the baby's room or any room in the house and includes personalization of name and the date of the event. It is printed on a composite base for long-lasting quality and includes a small stand. The cross measures 6 3/4" x 5 1/8" x 1/4" and the stand measures 1 3/4" in diameter and stands 3/4" tall. Personalize with name and date of up to 20 characters each. NOTE: Provide personalization information in the comment field during checkout.